features dual MA1400 Master Arc welding robots with multiple robot control, a high-speed trunnion positioner, integrated welding package, operator interface and a complete safety environment. 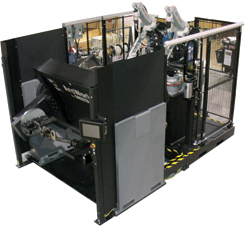 Independent drive on each of the three positioner axes enables an operator to index the load station or allows both stations to turn while the positioner sweeps, saving cycle time. Positioners are available with maximum payload of 550 or 1650 lb. ; the smaller unit indexes in 1.75 sec., the larger in 2.5 sec. The width of the positioner/workcell is only 1 m wider than the fixture span, and since the positioner can be serviced from the front of the workcell, additional space can be saved by placing cells next to each other without aisles. The positioners are available in standard lengths of 2 and 3 m between mounting surfaces, but can easily be extended. They provide a turning diameter of 50 in. to accommodate large parts and tooling, and independent servo-motor drives on each of the three axes provide high-speed positioning. This minimizes cycle times by allowing fixtures to rotate into working position while the main sweep axis indexes between stations. A PC-based human-machine interface (HMI) is available to provide cell- and production-related data. The HMI provides local control for memory backup, displays diagnostic data in an easy-to-read format on a color touchscreen, and presents graphs illustrating cell I/O and uptime data.